Takeaway: Hop crops are in big demand these days, but can they be grown hydroponically? Let's take a look. Hops take a long time to mature and produce for a short period. Outdoors, most hop farmers won’t see full crop maturity until three years after planting, and harvests occur for only three weeks from late August to early September. As such, farmers—and indoor growers—must account for annual operation costs, labor costs, and drying and processing costs, and weigh those against future market values to determine if the crop is worth their time to produce. For an idea of the competition within this space, there are only a handful of commercial hop harvesters operating worldwide, and the majority are within 100 miles of the US-Canada border. Washington, Oregon, and Idaho together account for the lion’s share of western hops, roughly 98 per cent of US and one-third of the global hop supply. Ten miles south of the border in Idaho, Elk Mountain produces hops for Anheuser-Busch and is among the largest operators in the world with an 1,800-acre plantation. Also, another consideration with hops is that they take an enormous amount of space. Traditionally, hop bines (that’s not a spelling mistake; hops are bines, not vines) climb 18 feet up a post before tumbling back down on lines. Farmers sometimes also run cables between anchor posts then run lines down to individual plants. Spaced every few feet apart, one can fit roughly 800 plants on an acre. Indoors, growers could fashion a trellis for their bines, but this would still take up a huge amount of space. So, with these considerations in mind, here’s a few tips on growing hops indoors for those who decide to put the effort and resources into growing these monstrous bines. Before starting a hop farm, there is a good deal of infrastructure to be planned. Hops typically prefer moist regions with sandy soil. Prospective growers will want to keep this in mind when selecting an indoor growing location and medium. Stacked fabric containers might be ideal for some systems that can use compost teas as a key ingredient, while large plastic containers are perfect for recirculating solutions. Aeroponic systems may also help growers get more bang for their buck while lowering operation costs. Aquaponic designs can maximize harvests even further while eliminating most, if not all, operating costs. With a little guidance, hop entrepreneurs can develop farms to run entirely independent of grid systems. Bines grow similar to vines, and are super aggressive. Hop growth can be encouraged by manicuring the main bine. This helps control the space the plant takes up while increasing harvest potential of the flowers. As mentioned above, indoors, growers could fashion together trellises if they elect not to have the bines climb up before trailing back down. For training and harvesting purposes, it would be best if these were adjustable. Reinforced cattle fencing may make for an ideal screen of green (ScrOG) solution, but this would increase production costs. With hops, growing the plant is only half the battle. Harvesting, processing, and distributing it can be another set of challenges. Hops can be either used immediately, or kilned and pelletized. While pelletized hops have a longer shelf life, allowing for shipping across the country, local brewers may appreciate fresher hops. Local chefs may even pay a premium for the ingredients they need for a fresh hop-honey glaze. However, since hop flowers can be a relatively low-priced commodity, growers may need to supplement revenues. One method could be by companion planting or integrating other crops to maximize time and space throughout the season. Whether they choose to blow up a canopy, or have the bines strung back down to the ground, growers will want to take advantage of light and space where they can. Growers can even grow their hop rhizomes in a container of their choosing atop large fabric pots full of companion plants. Should growers choose to plant companions, it’s wise to take full advantage of the benefits each offer. Spearmint, lemon balm, and comfrey are great at repelling insects and ground critters, and are also handy to make essential oils from. Walking onions, garlic, and super hot peppers may do the same while also providing an edible value. Growers may see multiple harvests from companions while waiting for their hops to reach full maturity. Another source of revenue could be from the hop plants themselves. Oils from the leaves can fetch attractive prices from the right buyers. Also, a benefit of growing rhizomes like hops is, once established, they can be broken off and repropagated. Savvy growers could potentially tissue culture their healthy stock to build up noble variety inventories before transplanting or selling them outright. So, while one can certainly begin hops inside, it might be best to ultimately reserve that space for brewing, processing, or growing a completely different crop altogether. If, however, hops are a dream grow, be sure to plan ahead and waste nothing from rhizome to flower. Above photo by Darryl Cotton of 151 Farms in San Diego, California. Beer. Just writing this word is enough to make one thirsty and conjure up images of frosty mugs overflowing with frothy, hop-infused goodness. Beer has been around for millennia—the first recipe dates to ancient Mesopotamia—and its popularity has never been higher. This ever-increasing desire for beer has lead to an explosion of craft breweries and a seemingly infinite spectrum of brews to choose from. Never has the future of beer been so bright… save for one thing. Enter climate change and its droughts, which just so happened to hit the old hop yards of Europe, famously in England and Germany. This has led to a shortage of the high-quality hops grown in these regions. The hop plant (Humulus lupulus) is mainly used to flavor and stabilize beer, and many popular craft beers use as much as three times the amount of hops as the large commercial brands. With future droughts almost certain and the need for quality hops on the rise, some people are turning to hydroponics as a solution. 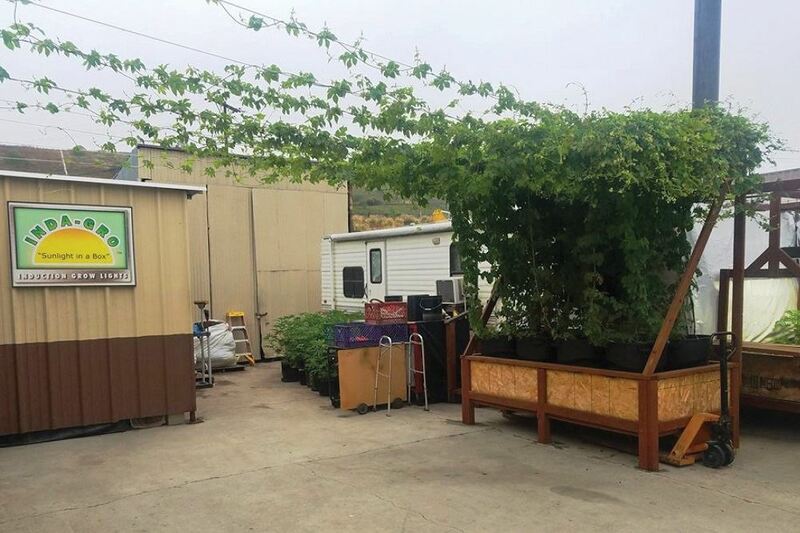 Growing hops using hydroponics in a greenhouse or indoors greatly extends the growing season. It allows growers to keep the plants in the appropriate 50-80˚F range far earlier and longer than traditional farming can. Growing hops hydroponically also offers growers the ability to focus and target oil production within the hop cone (the flavor and anti-bacterial properties of hops are largely contained within the various oils produced by the plant). This is achieved by controlling the precise levels of nutrients the plant is receiving during the various stages of growth and development. It is also easy to hand-harvest the cones of hops grown hydroponically, keeping the essential oils intact. Finally, hydroponic hop farming is highly sustainable. It uses less space, less nutrients, and you have control of wastewater. There is little to no pesticides used, which protects beneficial insects, and there are far fewer emissions from tractors and farm equipment. So, while there may be a shortage of quality hops, coupled with explosive growth in the craft beer market, there is nothing to worry about. The world of hydroponics is renowned for its ingenuity. There is no doubt in this beer drinker’s mind that growing hops using hydroponic techniques will help solve this problem and we can enjoy drinking and making our favorite brews without disruption.